When “Walking Dead” season starts, we have dinner at my sister and brother-in-law’s house every Sunday night. Helen, Anthony, Old Goat Honey, and I are huge fans of “The Walking Dead.” Unlike Helen, Anthony, and Old Goat, however, I never liked zombie movies. In fact, I don’t really like horror movies at all! At least not the gory ones. I made the mistake of watching “Friday the 13th” once when I was younger (if you can call peeking between my fingers “watching”) and I had nightmares for weeks afterwards! But for some reason, “The Walking Dead” has drawn me in just like thousands of other fans. So during the season, Old Goat and I trek faithfully over to Helen and Anthony’s house every Sunday where we all have dinner and then sit down to watch the show together. Dinner preparations are usually a combination affair. Helen makes some of the dishes and I make the others. This Sunday, I offered to be in charge of the entrée and the dessert. Since I was going to be making the main entrée, I thought I should do something simple for dessert. 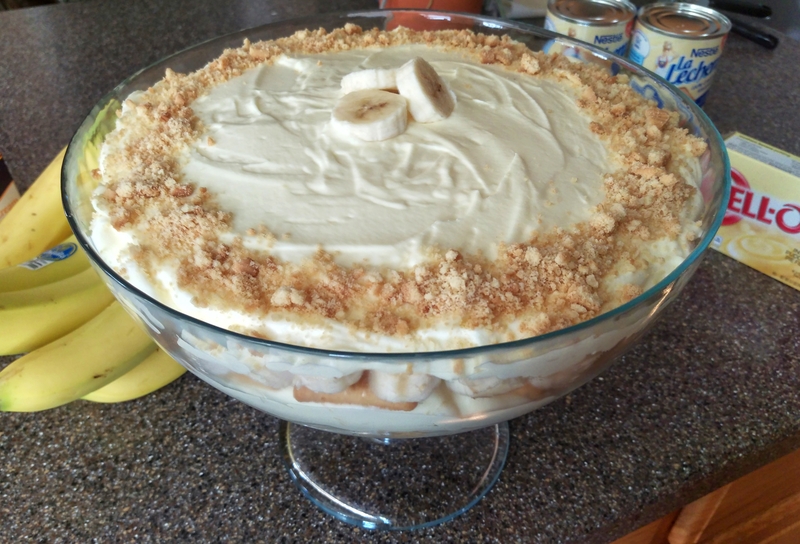 I used to make this banana pudding for my kids all the time when they were little. It’s one of those dishes on my list of “Comfort Foods.” And what could be more fitting when you’re watching a scary movie than a comfort food dish? Mix together the water, condensed milk, and pudding mix until smooth. Refrigerate for 5-10 minutes or until it sets up. Whip heavy cream until soft peaks form. Working in thirds, fold the whipped cream into the pudding mixture until well incorporated. In a trifle bowl, layer vanilla wafers, sliced bananas, and pudding mixture; continue until you’ve used up all the pudding mixture. If desired, sprinkle some crumbled cookies and add some fresh banana slices on top for garnish right before you serve.